The Cleveland Cavaliers are definitely keeping their options open. Days after it was reported that they are interested in bringing three new players to Cleveland prior to the Feb. 8 NBA trade deadline, another name has been added to the list. According to NBA.com’s David Aldridge, the Cavs have inquired about whether or not the Atlanta Hawks would be willing to part ways with shooting guard Kent Bazemore. “The Cavs have also asked about Atlanta’s Kent Bazemore, according to league sources,” Aldridge wrote. “Bazemore is no lockdown wing, but he does give effort, and he is shooting a career-best 37.6 percent this season on 3-pointers. 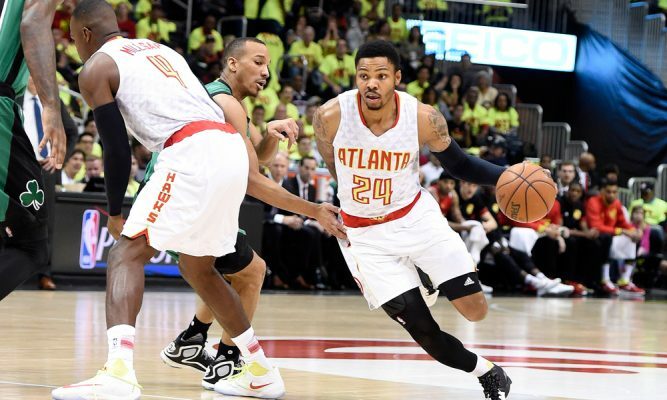 Bazemore has more than $37 million coming to him through 2020 on his current deal, though. Bazemore is currently averaging 12.6 points, 4.3 rebounds, and 3.7 assists per game so far this season. While he may not be a lockdown wing defender, he has posted a positive defensive rating for four consecutive seasons. He is also a dangerous option from beyond the arc and is averaging 37.6 percent from beyond the three-point line. Over a month ago it was reported by Steve Kyler BasketballInsiders.com that the Hawks would be willing to move Bazemore if the price was right. “League sources say the right combination of ending contracts and a first-round pick, even one highly protected might be enough to get Bazemore in trade, especially for a team looking for a scoring punch,” he wrote. Knowing that, the Cavs would likely try to offer Channing Frye‘s expiring $7.44 million contract. It is not clear whether or not they would be willing to part ways with a draft pick though. The answer to that question would likely be dependent on just how serious they are about bringing Bazemore to Cleveland. The NBA trade deadline is getting ever closer, but there is still more than enough time for the Cavs to make a splash. They’re clearly still weighing all of their options. Soon enough they’ll have to get serious about putting their chips on the table.